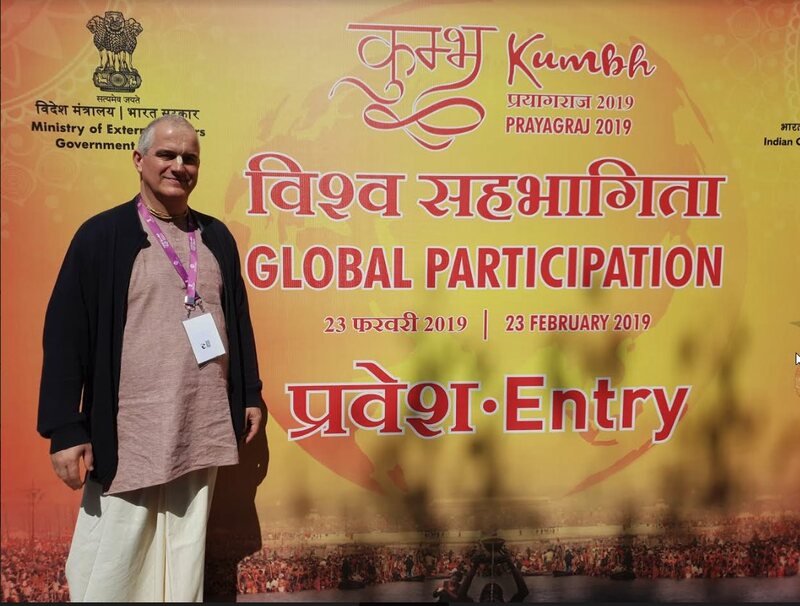 Under the organization of Ministry of External Affairs Government of India and Indian Council for Cultural Relations, Prayagraj hosted at least one person from every country at the occasion of the sacred Kumbh festival. Kumbha Mela is unique and world’s largest event in which hundreds of millions of spiritualists converge for a holy dip at the confluence of the sacred rivers Ganga, Yamuna and invisible Saraswati. UNESCO has recognized this festival as an Intangible Cultural Heritage of the humanity. Delegates from all over the world were astonished by the hospitality, organization and spiritual atmosphere that was present during the two days visit to India. After the amazing cultural and spiritual experience on Kumbha Mela, next day, delegates had special opportunity to meet Honorable Prime Minister of India, Mr Narendra Modi and Minister of External Affairs, Mrs Sushma Swaraj. Honorable hosts addressed the audience and stressed the unity in diversity that is seen in such events. Delegates from different countries expressed their appreciation for kindness and care of our hosts. People started to call each other brother and sister as unity grew among the attendants. Smiles on the faces of delegates from Croatia, Iran, Zambia, Israel, France, Iraq, Cook Islands, Saudi Arabia, Costar Rica, Ivory Coast, China, Spain, Brasil and all other countries gave us a feeling of human family like I never felt before. For two days it felt like Bharata Varsa again on some different level. … Reem Ibrahim Al-Arfaj is the first certified yoga trainer in Saudi Arabia. On her first visit to India this past week, she was left mesmerized by the Kumbh mela at Prayagraj. “It was amazing. Everyone was smiling and they were excited to meet us. The security there was very high and we felt very safe among those people,” said Reem, who is in her 20s. “I am a businesswoman and help my father in his business. I heard about yoga and it attracted me. So I enrolled for this programme at the Indian Embassy in Riyadh. Now I can train others in yoga,” she said with a glitter in her eyes. “I read Bhagavad Gita and since then I was attracted towards spirituality and Vaishnavism,” Goran said as he flaunted his ‘bodi’ (tuft) and the ‘janeo’. Born in a Christian family, Goran finds no contradiction in the faith of his forefathers and his own “spiritual path”.